Not sure how to dazzle your grad photo shoot? You only graduate once, so make sure to look picture perfect by incorporating the following tips and products into your beauty routine! In order to look your best for photos and not require heavy editing, do your best to take care of your skin. If you have sensitive skin, avoid new products that you haven’t tested. You don’t need to have a reaction right before your photo shoot. Make sure to use sunscreen when you are outside regardless of weather. No one wants to look like a tomato or be peeling in photos! Alba Botanica Hawaiian Sunscreen is an excellent choice. This sunscreen is SPF 45 with green tea, meaning it won’t leave behind that potent sunscreen stench. It has a smooth, lotion finish, leaving your skin soft and smooth. 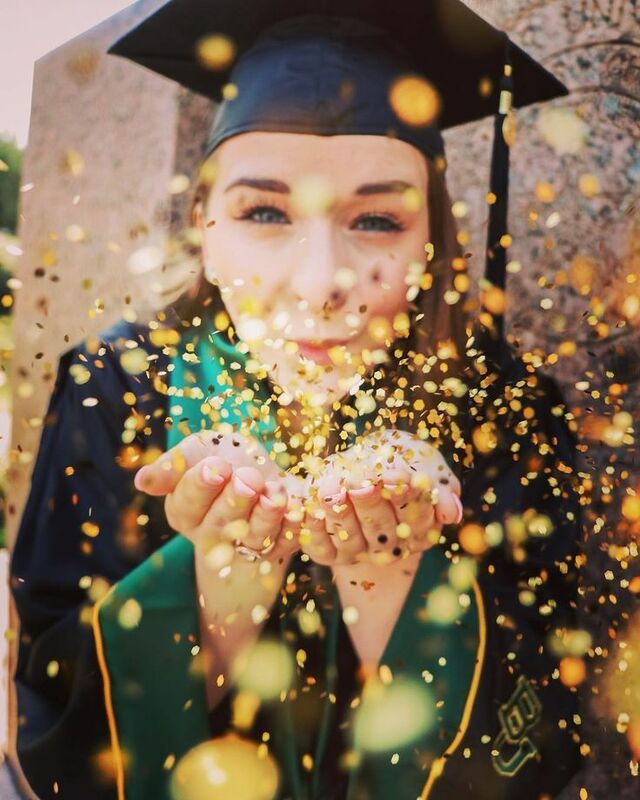 If the sunscreen or cold weather prevents you from getting any color at all and you feel you are looking too pale, feel free to incorporate L'Oreal Sublime Bronze Self-Tanning Towelettes into your grad photo routine. These towelettes are convenient single-use wipes. They also have AHAs and Vitamin E to ensure healthy, flawless skin. The color is a nice medium tan, not too dark or orange. Give yourself enough time to dry before getting dressed after application. Use this product with the sunscreen as it does not provide protection from harsh rays. Make sure to test this far enough in advance to make sure the shade still looks natural and isn’t too dark or dissonant from your normal skin tone. If you are going to take any pictures up close or holding your personalized cap, make sure your nails look good! There’s a reason they say to get your nails done before you get engaged - how your nails look could make or break a photo. Go for a classic French Manicure or a light pink to give a relaxed look, or your school colors to be spirited! Have a broken nail? Fix it with Krazy Glue before painting it! You can do so with a teabag or with one-ply toilet paper! Just cut a tiny piece of the teabag or TP that is big enough the cover the crack in your nail. Cover the crack with your paper and squeeze a drop of super glue on top! Then just let it dry, file if necessary, and paint over it. If your already-painted nail breaks, glue it back together by glueing a small piece of tissue or teabag under your nail to re-enforce. For close up shots, you want to be sure your eyes pop with natural, classic makeup. Use basic, matte foundation to avoid unwanted shine in pictures. Also, get your eyebrows under control with some gel or pencil filler. Stick to a subtle, blended contour and don’t use sparkly highlighter if you are trying to look natural. For eye makeup, Almay has the perfect Meet Your Squad eyeshadows that each offer four finishes: matte, satin, metallic, and glitter. We suggest the shade Unicorn and Never Settle for a natural look, using Unicorn to lighten the inner corners of your eyes and your brow bone while using Never Settle in your crease. We also suggest using the satin or matte finish for natural makeup, but you can spice it up by using the glitter or metallic finishes. The eyeshadow applies smooth. Whatever you choose, BE SURE TO BLEND. Finish the look by tightlining with black or brown pencil liner and mascara. Or, you can go for a fiercer look with a dramatic eye or lip. We suggest the shade Ambition for a more dramatic look, paired with winged liner and falsies if you desire. Don’t forget to blend your falsies with your natural eyelashes by applying a coat of mascara. For lip, try the Buxom VaVa Plump Shiny Liquid Lipstick. This lipstick is a bright rouge sure to catch attention. Finish either look with setting spray to stay flawless all day! If you have naturally straight hair, mix it up by giving yourself some natural, voluminous curls. Start by splitting your hair into layers, at least two for thin hair and many for thicker hair. Start curling from the bottom layer. Make sure to use a big barreled curling iron to have the most genuine looking curls. If you want to give thin hair more volume, use Bed Head Superstar Queen For a Day Thickening Spray. Even by just applying this to straight hair, we’ve received compliments on how voluptuous it made our hair! Sometimes after we curl our hair it gets a bit frizzy. If you have Bed Head Get Twisted Anti-Frizz Finishing Spray on hand this won’t be a problem! If you have naturally curly or wavy hair, apply this product to wet hair after showering to keep your locks neat and in place. We hope you found these tips helpful. Remember: the best way to look flawless is to let your inner beauty shine outward! Hi! I'm a junior at Pitt and I finally learned how to pump my own gas (But only at some gas stations - sorry, I'm from Jersey). I'm a big fan of cities, fast cars, alternative music and thinking outside the bun. Katie is a senior at the University of Pittsburgh studying political science, creative writing, and Arabic. She is a brother of Alpha Phi Omega and a member of College Democrats. After graduation, she wants to take a gap year then go to law school or graduate school for a degree in Middle Eastern Studies. Some of her favorite things besides writing are coffee, cats, the 100, Ed Sheeran, lemon and mint juice, and making art.